Rayman Legends is the sequel to Rayman Origins, an Ubisoft game that brought the Rayman series into a new realm of entertainment. The previous game in the Rayman series was called Rayman Origins, and this game is a exceptional extension of that amazing title. 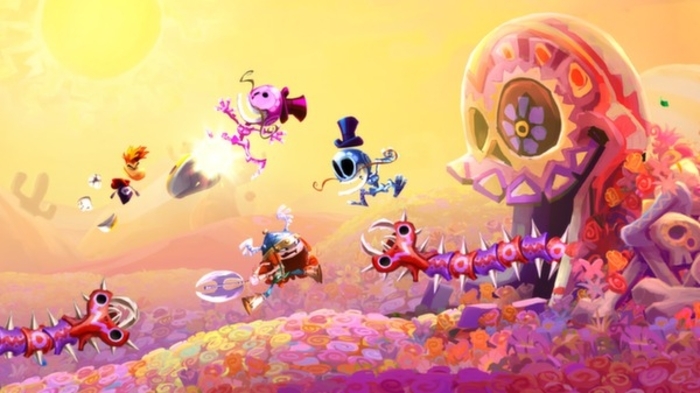 Released only a year after its prequel, Rayman Legends provides players with many new challenges and adventures. Rayman is famous for his lack of arms and legs despite having the floating appendages of hands and feet. He is the main character of the game, and he lives along with his friends in the Glade of Dreams, but he'll have to save the world again if he wants to keep his friends safe from evil. There are roughly one hundred levels in this game, so the amount of content is stellar. The levels are broken up into worlds, much like the original Mario games, and each world has a different theme, like medieval or underwater. Some worlds are even accessible by jumping through paintings, which might sound familiar to those who played Mario 64. This game has quite a bit more content than the previous edition, and it will take players hours to search through the game to find all its secrets. Players who are more relaxed can enjoy the immense game and the vastness of the different levels. Even brand new players should have no problem taking control of Rayman right out of the gate in Rayman Legends. The gameplay is intuitive and simple, and it only requires a few minutes for standard players to understand the subtleties of the controls. The game certainly isn't easy since there are a number of highly difficult levels, but the controls are simple enough to pick up quickly. Perhaps the most innovative feature of this game is the addition of multiplayer mode. Up to four players can play on a split screen or online multiplayer. What's great about multiplayer is that every player will have a different role. This is called asymmetric gameplay, and it easily allows novice players to enjoy the game alongside more advanced players. Rayman Legends might only be a 2D game, but it has some of the best graphics of any such game. One of the most interesting thing about the graphics of Rayman Legends is that the engine powering the game allows for hand-drawn images to be included in the game exactly as they are. This almost makes the game feel like a cartoon that the player is directing from within. While perfection may technically be unattainable, Rayman Legends comes as close as possible. The game has no defects that make it difficult to get through, and its multiplayer mode is highly addictive. There aren't any other games with the same premium audio and visual effects, and while the style of gameplay isn't too different from Rayman Origins, this game is more than worth the additional title.